I'm reading Marianne Williamson's book "A Course in Weight Loss" and listening to her CD, "Meditations on Weight Loss". On the meditation CD, she urges people to go into their kitchen and bless it. The blessing includes a beautiful prayer and a forgiveness exercise to let go of the food-related pain that you've experienced in your kitchen. Marianne guides you into removing everything from your pantry and your refrigerator - holding each item one at a time with no emotional investment, then letting go of it emotionally, while placing it back in the pantry or throwing it away. Its really a very beautiful exercise. However, I don't need to bless my kitchen. It has virtually nothing to do with my weight. In fact, my kitchen would be my weight loss buddy if I would let it. The problem is that I really have no interest in having my kitchen as my weight loss buddy. What I'm going to do is bless restaurants. I'm going to bless them all, because those are the places that I have difficulties. Those are the places that I have too many choices and am served too big of helpings. Those are the places that I am entertained by my friends and focus on the entertainment rather than what's going into my mouth. Those are the places that my mouth is already open because I'm talking and it's easy to just stick stuff in there. Subway has already been blessed. I think Jared did it. And Cindy did a beautiful blessing of El Paragua. * This is a restaurant where I experience eating as an act of self-love rather than self-hate. * This is a restaurant where I feed my physical hunger with good, nourishing food - and feed my emotional and spiritual hunger with good, nourishing camaraderie. 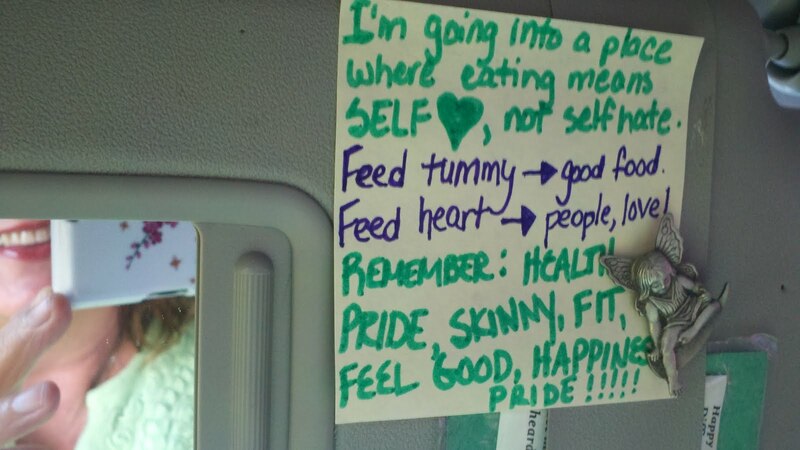 * This is a restaurant where I make good choices - choices made out of a desire to be healthy and proud of myself. Not choices made out of a need to escape and feed my hungry heart. I made myself this "sticky" to put on the visor of my car (believe me, it's always down so I can check my lipstick). I'm going to read it before going into any place that has anything to do with food. If you have any blessings.... or affirmations.... or mantras - please share.